Sensex, Nifty close in red; Midcaps outperform. Although the market closed in red, it has shown the strength to recover in late trade. After two-day winning streak, the markets on Thursday closed down with the growth concerns from China and Japan economic data. 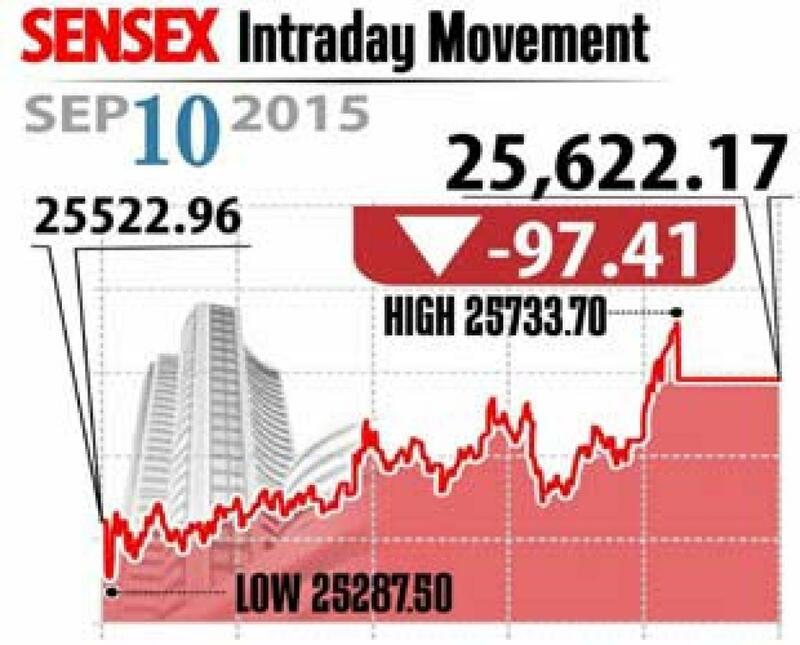 Mumbai: Although the market closed in red, it has shown the strength to recover in late trade. After two-day winning streak, the markets on Thursday closed down with the growth concerns from China and Japan economic data. BSE Sensex closed 97 points lower at 25,622, Nifty was down 30 points to close at 7,788. Meanwhile, the broader markets, however, showed divergent trend with midcap closing up 0.6 per cent and smallcap down by 0.4 per cent, respectively. Experts say that the resilient market has shown smart recovery in the last hour of trading which explains that the markets are expected to bounce back soon. On the sectoral front, excepting capital goods and auto indices all other indices have closed in red. Metal shares closed weak following China economic data with Hindalco, NMDC and Jindal Steel lower over 2 per cent. While auto share prices increased with the increase in the domestic car sales by 6 per cent and two-wheeler sales down by 3 per cent. However, Bajaj Auto ended up over 1 per cent, while Maruti ended 0.1 per cent, M&M gained 0.6 per cent. The gainers in Thursday's trade were: Tata Motors, up 2.71 per cent at Rs 354.25; BHEL, up 1.74 per cent at Rs 216.55; Bajaj Auto, up 1.47 per cent at Rs 2,302.45; L&T, up 1.31 per cent at Rs 1,613.25; and ICICI Bank, up 1.15 per cent at Rs 267.45. The losers: Hindalco Industries, down 2.61 per cent at Rs 76.55; HDFC, down 1.89 per cent at Rs 1,164.15; SBI, down 1.71 per cent at Rs 227.60; ONGC, down 1.71 per cent at Rs 226.65; and Wipro, down 1.71 per cent at Rs 551.40.